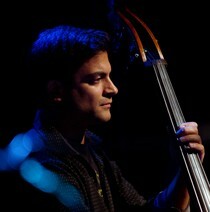 Bassist Dan Asher has been busy performing and teaching in the New York area for much of the past decade. After graduating from Lawrence University in 2001, his active schedule has included performances at legendary jazz venues such as Birdland, the Blue Note, and Smalls, covering a wide range of music including Jazz, R&B, Afro-Cuban and Brazilian. He is a member of the Broadway Boys, a talented group of vocalists and instrumentalists who continue to pack theaters and jazz venues all over the country with their improvisational takes on current Broadway repertoire. He has also maintained an active teaching schedule with private students and ensembles throughout the Tri-State area. For more about Dan, visit www.myspace.com/danashmusic.